My Funny, Funny Family: Poutine! 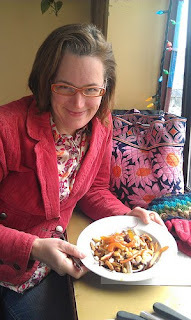 In my post about my first night in Montreal, I mentioned having poutine for dinner. What is poutine, you may ask? 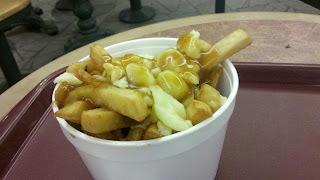 Why, it's a Montreal specialty -- french fries with cheese curds and gravy. Here's the one I got that first night, at Franx Supreme, a hot dog restaurant in a mall food court. It didn't taste very good. The gravy was kind of nasty. But I felt I should press on. 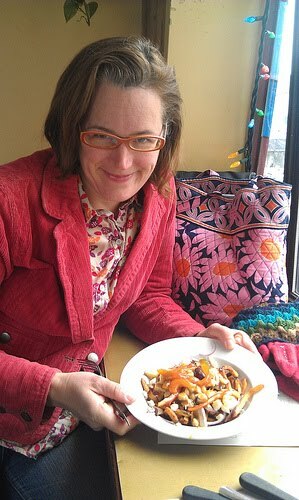 After all, there are all sorts of poutines and chances are this just was not the best poutine Montreal had to offer. The next day, just before we climbed Mount Royal, the city's namesake, we stopped at a cute little cafe where the French guy behind the counter was chatting with an English-speaking friend. We got the house specialty poutine, which was covered with grilled vegetables. I'm not usually a big curd fan, but the heat of the fries and gravy melts the curd into gooey globs and makes it palatable. I saw you tweets and was wondering what this mystery dish was--but not so curious that I asked Google. Looks, uh, interesting.